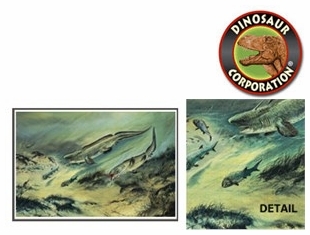 Prehistoric shark, Xenacanthus decheni-Carboniferous period. These beautiful state of the art hand made note cards feature photographs of Josef Moravec's oil paintings. On the backside of the card is a description (such as weight, size, time, diet) of the animal depicted on the front. The size of the card is 5" x 7". The card is blank inside. Great as Invitation VIP Cards for Museum of Natural History Dinosaur Parties.